In recent years, the need for a more rational and efficient management of energy has emerged as a strategic and urgent issue for an integrated iron and steel plant. Today energy plays an important role in the operation of the steel plant and inefficient use of energy has severe adverse effect on the plant bottom line. In fact, energy costs make up a large percentage of total operating costs. This has made the management of the steel plant to focus its attention on the use of energy in the plant and the efficient management of energy usage has become one of the prime objectives for the management of every steel plant. Active and efficient management of the energy not only helps in the energy conservation and minimization of environmental impact but it is also crucial in ensuring the competitiveness of the steel plant. There are no standard solutions which can fit into every plant towards the effective management of the energy, since each plant operates in an environment which is unique to it. However there are some guiding principles which help in the effective management of energies. There are several opportunities which are available at every steel plant to reduce the energy consumption in a cost effective manner. These opportunities are required to be exploited by proper and careful management of the energy. For achieving success and positive results from the effective management of energy, it requires commitment from all the levels and functions of the management of the steel plant, especially from the top management. Effective management of the energy results into the following. It provides opportunities to decrease the energy intensity/ton of crude steel. It provides best or good practices to utilize energy sources more effectively. It provides best or good practices to recover energy (heat, and gas etc.) wherever practical. It enables the steel plant to develop plans for plant energy intensity reduction. It helps prioritization of the capital investments for improving the energy efficiency with the biggest impact. It optimizes purchase and consumption of all fuel types and energy inputs. It provides opportunities to reduce carbon di oxide (CO2) and other emissions. In an integrated steel plant, a large variety of energies are used at a large number of consuming points. This makes management of energy a very complex process. Thorough knowledge of different energy consuming processes is necessary for the effective energy management and the efficient energy usage. Effective management of the energy cannot be done alone either by the energy department or by the individual production shop. It has to be team effort with the participation of every one. 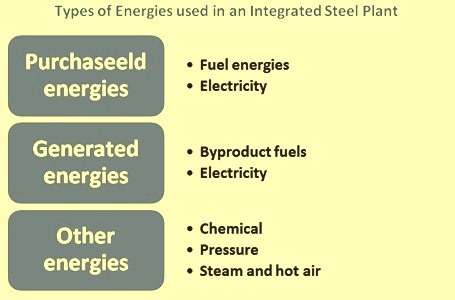 The following are the types of energies (Fig 1) commonly used in the steel plant. Purchased energies – Purchased energies form the major component of the steel plant energy usage both quantity wise and cost wise. Purchased energies are normally in the form of fuel energy and electricity. Purchased fuel energies consist of (i) solid fuels (mainly coking coals, non-coking coals and metallurgical coke etc. ), (ii) liquid fuels (mainly furnace oil, light diesel oil, low sulphur heavy stock, and high speed diesel etc. ), and (iii) gaseous fuels (mainly natural gas and liquefied petroleum gas etc.). Electricity is usually purchased through the utilities companies at high voltage. Generated energies – Generated energies are those energies which are produced within the steel plant and it forms the second highest component of the steel plant energy usage. The generated energies are normally (i) byproduct energies (coke oven gas, blast furnace gas, converter gas, and coal tar fuel etc. ), (ii) gaseous fuel (acetylene etc. ), (iii) electricity produced by using purchased fuel or produced during the recovery of the waste energy, (iv) undersize fractions of coke generated at coke ovens and during screening of coke at blast furnace, (v) generation of coal dust generated from dust extraction units during coal handling. Other energies – These are (i) chemical energy (contained in hot metal), (ii) pressure energy (blast furnace top gas, compressed air, and hydraulic fluid etc. ), (iii) process steam (produced in power plant or produced during recovery of waste heat), and (iv) hot air produced during recovery of waste heat. Efforts made towards the management of energy, aim at the reduction of the energy use. They form the key elements in the overall management programs of the steel plant. Twin approach can be adopted for the management of the energy in the steel plant. It can be either system based which consists of standardizing of various processes involving energy or it can adopt a technical approach which is usually based on real time information obtained from process monitoring and control equipment and from the production plans. The first approach is a management approach where steel plant establishes the systems and processes necessary to improve the energy performance, including energy efficiency, its use and its consumption. It also streamlines all the processes connected with the use and conservation of energy under this approach. The second approach provides information on actual and planned energy indicators of production, distribution and consumption on real time basis to energy operators for the purpose of taking decisions and controlling the processes. The management of energy in the steel plant has several components which need serious attention. These components are described below. Quality of energy – Quality of energy plays an important role in controlling the cost of energy. Energy with lower per unit rate can increase the energy consumption and overall energy cost, if the quality of the energy is lower than the desired level. Examples are coal with higher ash and low calorific value, electricity with improper power factor. Quality of raw materials – Quality of raw materials also has a big impact on the usage of the energy and hence the cost of energy. Lower quality of raw materials means higher gangue entering the process which not only affects the process productivity but it also need large amount of heat for its removal. Lower quality raw materials may look cheaper since it has lower per ton rate but it ends up in higher cost of production, because of higher energy usage and lower production due to lower productivity. Handling losses, spillages, washing out of the materials at the edge of the storage piles, and self-ignition are some of the areas which need close watch for controlling the consumption of the energy. Also storing of the coals for a very long period result into weathering action and deterioration in the quality of coal takes place, which in turn increases the consumption of the energy. Process stability – There are a large number of production processes in the steel plant. Many a times these processes get disturbed and become unstable due to several factors. Processes which are stable during operation have much lower specific energy consumption than the processes which are running under unstable conditions. Hence any process which has become disturbed and unstable should be brought back to stable regime at the earliest possible time for the control of the energy consumption. Inefficient and inadequate maintenance – Equipment not maintained properly need additional energy in operation. The need of the additional energy may be due to the reason that the equipment has to overcome more resistance during its operation. Inefficient and inadequate maintenance also results into frequent breakdowns which mean a large number of unplanned stoppages and starts up of the equipment and the resultant higher energy consumption. Further during breakdowns, furnaces are to be kept hot at minimum temperature levels which need a substantial amount of unproductive energies. Line losses, leakages and flaring- Line losses and leakages result into energy drainage. This drained energy could have been used for productive purpose. Condensation also leads to energy losses. Actions like effective monitoring of the pipeline condition for timely plugging of the leakages, effective maintenance of the pipelines, and keeping the pipeline temperature above the condensation temperature are needed under effective management of energy. In this regards it is to be ensured that proper insulation of the pipelines are in place and there is no damage to it anywhere along the length of the pipeline. In case of electric energy, the line losses can be reduced substantially by transmitting the power at higher voltage and then reducing the voltage to the required level near the point of consumption. Flaring of gases is the direct loss of energy. Accurate planning for energy consumption and making provision for gas storages can reduce/eliminate this loss of energy. Handling of solid wastes – Solid wastes like scrap, dust, sludge, mill scale etc., are in partially processed stage when they are generated during various production processes. Processing and recycling of these solid waste materials saves energy since it reduces the use of equivalent amount of raw materials and also the energy required for the processing of these raw materials. Size of the equipment – Oversized equipment usually installed for future capacities additions, need higher amount of energy since they operate at lower productivity level. Further when the equipment goes down for maintenance then higher amount of energies are needed to maintain the minimum required temperatures of the furnaces. Idle running of equipment – All the equipments are required to be operated as per process requirement. In some areas of the plant, the duty cycle (amount of time equipment is working divided by the total operating time) can be as low as 25 %. The simplest solution to avoid idle running is to turn the equipment off or slow it down when it is not working so it does not waste energy. Heat sink fans for motors and drives can also be sequenced to turn on or off depending on use, thus reducing the use of unnecessary power. Use of water – Steel plant needs a large quantity of water both for process needs as well as for cooling of the equipment. With accurate planning and proper design of the water systems, there can be substantial reduction in the requirement of energy needed for the operation of water pumps. Bringing down the temperature of cooling water also has a positive effect on the energy consumption. Plant lighting – Plant lighting constitute substantial energy load in the plant. Effective use of sunlight with the help of the translucent sheets and use of LED lamps for lighting can result into substantial saving in the energy consumption. A large number of energy efficient technologies have been developed for different production processes of the integrated steel plant. There is a long list of these technologies. Many of these technologies recover waste energies and recycle them back in the system. Some of these technologies use energy in more efficient way. Most of these technologies have a very low pay back periods. It is always advisable for the steel plant management to give priority for finding capital to invest in these technologies since the investments are paid back soon and makes the plant economically healthier for a very long time. Earlier management of energy in the steel plant used to be largely based on historical statistics. This meant delayed corrective action and hence delayed results. In recent years continuous monitoring of energy consumption is being done and it is very important for the management of energy. In this regards, setting up of a centralized energy centre is an essential step. It monitors the energy flow throughout the plant. This energy centre is normally connected to the energy producing and consuming centre through instrumentation and remote PLCs for getting the real time data regarding energy consumption and the energy cost. The centre integrates the energy consumption data of all the production processes in the entire plant and helps in its close monitoring and proper analysis. The analysis shows where savings can be generated. It also identifies areas in which energy byproducts (e.g. in the form of waste heat or gas) are not being exploited. This in turn enables the management to optimize the production processes. The centre helps in taking corrective measures if any abnormality is noticed in any process of the plant. The energy centre generates proposals for energy-efficient operation of steel plant production facilities and helps plant operators plan production in a manner that ensures optimal energy consumption. The energy centre also helps generation of energy consumption forecasts and helps prevention of load peaks which in turn helps in controlling the demand charges. In general, the energy centre makes the steel plants more energy efficient and reduces its carbon dioxide emissions. These days supervisory control and data acquisition (SCADA) system is used for the energy monitoring in the energy centre. SCADA system gathers all plant site energy information and manages the load dispatch. Energy information to SCADA system is provided by remote PLCs and field instruments. Energy management optimization tools are used for high performance energy process data management and for the recording of time series – both historic and forecasts- of measured and calculated data. For this real time process data is collected from various data acquisition systems through interfaces and stored in the database as time histories.